← Lizzie McGuire Likes Cupcakes! It’s no secret how I feel about Girls. While I am backed up on my DVR and have yet to see last week’s season premiere, I have been begrudgingly following them in the news. 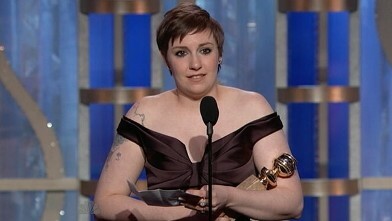 First, the show won a Golden Globe for Best Television Series – Comedy or Musical and Lena Dunham picked up the statue for best comic/musical actress (beating out f—ing Julia Louis-Dreyfus and Tina Fey, among others!!!). Second, Dunham went on Howard Stern this past Wednesday where she defended her appearance by claiming that “I’m not super thin, but I’m thin, for like, Detroit.” Face palm. I get what she’s trying to say here but it comes off as completely smug and condescending. Failure. I almost feel bad for her in the way she constantly puts her foot in her mouth (anyone remember the tweets she sent to B.J. Novak and Mindy Kaling about dressing up as Canadian serial killers and one of their victims?) but then I am reminder she got a $3.5 million advance to write a book so, nope, no sympathy for her! There were moments reading the script that I thought, ‘WOW, okay! It’s the most private thing anyone can do, but being an actress can make you feel vulnerable. Is she talking about her infamous masturbating in public scene? Dumping her boyfriend while riding him? So many choices, so much vulnerability. Human beings-please make other digital time capsules. NOW!